What is a Gate System? While many companies offer gate installation, only a few install gate operators or gate automation. It’s very difficult to find a company that specializes in both- or what we refer to as Gate Systems. Most companies will only offer one or the other. At Budget Fence and Gate Systems we integrate both offerings into our comprehensive Gate System methodology and process. Instead of trying to coordinate multiple separate contractors for the gate, automation, and bringing power to the automation; wouldn’t it be convenient to utilize one company to bring it all together? 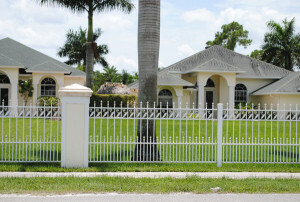 Budget Fence and Gate Systems specializes in all the aspects necessary to ensure your Gate System is something to be proud of, relied on, with the affordability to fit within your Budget. Our Gate Systems department manager has been serving our clients with us for over 15 years. He delivers a un paralleled level of knowledge, experience, and credentials to each of our projects. After managing for one of the most reputable Gate Automation wholesale suppliers in the industry for 10 years, our company was fortunate to enhance our profile by having him join the team. It’s with this expertise; your Gate Systems project will be guided and directed. A quick internet search will help you identify that Gate Repairs, or Gate Service is one of the most requested services in our industry by a landslide. Gates are the most heavily utilized and trafficked components to your perimeter or boundary security fence. Unfortunately, the likely hood of repair or service because of their high usage, improper installation, or inferior product selection can sometimes be inevitable. Never sacrifice the integrity of the install- This includes analysis of the most appropriate depth of the post hole and volume of concrete, size, thickness and material of the post and hardware to allow additional strength and rigidity to the structure. Never sacrifice the integrity of the Gate product itself- This includes properly identifying the weight load dispersal and distribution for the selected materials for the necessary gate opening. Never use an inferior Gate Automation Product– We select only the best available Gate Systems to deliver the most consistent performance for years to come. One of our strict guidelines- to utilize only products that have excellent track records of performance, has proven to be a success over the years. Inferior Automation products although initially less expensive, will ultimately cost much more over the expected life and duration of the product. Adhering to our philosophy gathered from evidence of decades of past experiences; can save our customers from constant headaches and accumulating maintenance or replacement costs. Initially other Gate System proposals may save you money short term, but cost you dearly in the long run taking a big hit on your overall project Budget. We look forward to providing you with an evaluation to the best solution for your Gate Systems project with one of our project consultants. © Budget Fence & Gate Systems - Contractors License Number = U-22038. All Rights Reserved.